Straightening your teeth has never been so colorful. For years, orthodontic patients have been able to personalize their braces with brightly colored bands. Braces colors ranged from single hues to rainbows of brilliant shades for a look that was all their own. Today, that personalization does not have to end with the end of active treatment. Dr. Papandreas offers colors for your retainer so that you can continue to enjoy a look that is completely you. Along with all the fun color options, you may even get to pick a fun design, too. Braces work by applying pressure to the teeth. This causes the bones and supporting tissues to adapt, but it can take some time for them to fully adjust after the braces come off your teeth. A retainer is recommended until your bite has fully stabilized. The retainer keeps your teeth from relapsing into their former positions. The retention phase can last a year or longer depending on your needs. 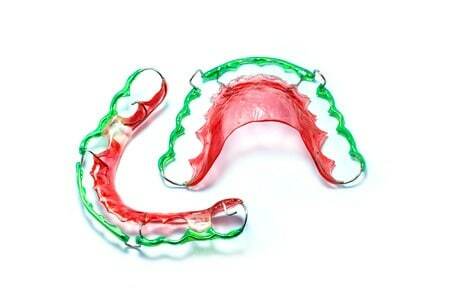 Some patients will need to wear the retainer all the time, and others may only need to wear it at night. Most people will need to wear the retainer for the same length of time as they were treated with braces. What Should I Expect from Color Your Retainer? Retainers are not designed to move your teeth but to hold them in position, and they are removable, which means that you can take them out to eat or to brush. Clean your retainer carefully each time it’s removed and when you brush your teeth. When you wear the retainer, you will have a thin wire stretching across the front of your teeth, but this is much less noticeable than braces. The colorful plastic will help keep the retainer secure. Our orthodontist can help you get the smile you deserve with a style that is all your own whether you are choosing colors for your retainer or braces. Check out our contact page or give us a call to schedule your appointment with Dr. Papandreas.